At Little Barn, we are proud of our strong heritage of serving great food in an atmosphere fitting for anyone from families to singles. Simply stated, Little Barn is a simple, country food restaurant that offers the biggest and best biscuits for breakfast, along with an all-star supporting cast of meats, sides, and sweet morning treats. Our lunch features nothing less than our secret family recipe for simply amazing Brunswick stew, chopped pork BBQ, and a few other favorites sure to delight even the toughest critic. We are only open for breakfast and lunch, so if you're in the neighborhood, stop on by and eat with us. 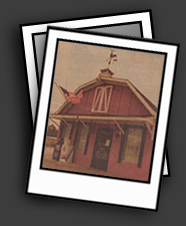 You can't miss us, we're the big red barn just a block from downtown Lawrenceville, GA.
Little Barn opened its doors on January 15, 1993 to an immediately accepting public who was hungry for something new. We pride ourselves in serving great food. In fact, our slogan remains: "Cookin' food better than your mama." Most newcomers to the restaurant comment about the extra large size of our biscuits. When first planning on how large the biscuits would be, founder Gene Briscoe just kept saying "bigger" and that's exactly what we did. We've made them the same ever since and will continue to take pride in our "big ol' biscuits!" 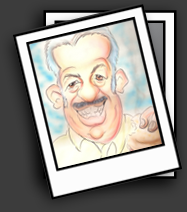 Founder Gene Briscoe [seen in the caricature to the right], was known in high school as "Biscuit" and was always predicted to own a thriving biscuit business in Splitsilk, GA. Well, his childhood friends weren't far off the mark when Gene opened the Little Barn less than 30 minutes away from Splitsilk in the bustling city of Lawrenceville, GA. He has sinced retired and the restaurant is now owned by his daughter, Laura Marlowe. However, he still pops in from time to time to enjoy an amazing salmon biscuit or BBQ sandwich and a glass of Diet Coke. Take the HWY 316 exit. Turn right onto HWY 20 and stay in the left lane. We're on the left once you get into Lawrenceville. You can't miss us in the big red barn on the left. Just loop around the block and come on in. For larger orders or caterings, please ask to speak with Laura Marlowe.